DC’s Shazam! finally arrives in theaters today, and as per the tradition, the film contains a couple of post-credits scenes. What’s more, since we’re going to be discussing both sequences here, those weary of spoilers should probably stop reading now. That being said, for anyone curious about the final scenes of Billy Batson’s solo debut, the first of the pair is a mid-credits sequence that teases our hero’s next foe. As you likely know, the main antagonist of Shazam! is Mark Strong’s Dr. Thaddeus Sivana, who ends the movie sitting in a cell. As he tries to access the powers he once received from the Rock of Eternity, a voice calls to him from the dark. We then zoom in on a small caterpillar with a voice box hanging around his neck. The caterpillar tells Sivana that there are more ways than he thinks to gain magic, before adding that the pillars of evil will soon assemble. The caterpillar in question is the diabolical Venusian worm Mister Mind, and from the sound of things, the bug is teasing the arrival of the Monster Society of Evil, one of the first supervillain teams in comic book history. It seems that Billy may have his work cut out for him in Shazam! 2. After that little sequence comes a post-credits scene that brings us back to Shazam himself, who’s having his powers tested by his best friend Freddie Freeman. Specifically, Billy is holding a fish bowl and trying to speak to the fish inside like a certain Arthur Curry would be able to do. After realizing that he doesn’t have this ability, Billy shrugs off the test and calls the power stupid. Even after making a billion-dollar movie, it seems that Aquaman still can’t escape the ridicule that’s plagued him for decades. 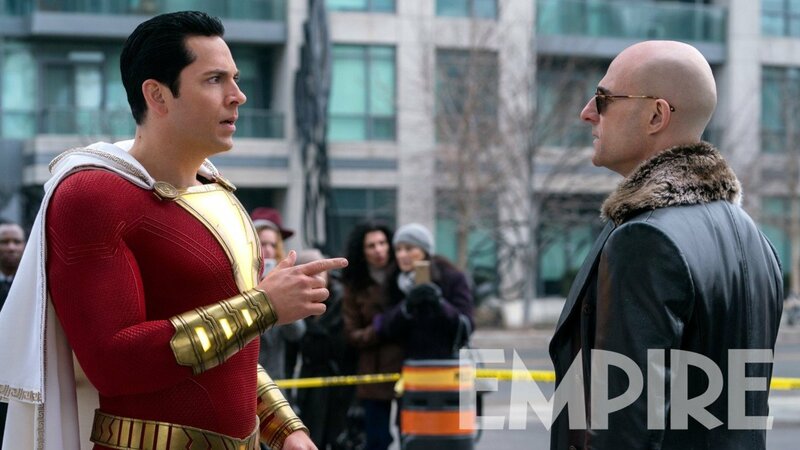 Regardless, we’ll find out if Shazam! can give the DCEU its second hit in a row as the weekend progresses.